From routine maintenance to emergency repairs, G&M Service can meet all your heating and cooling needs. No job is too big or too small when it comes to keeping your home or business comfortable. G&M provides year-round service that puts excellence and customer service first. Don’t compromise when it comes to your indoor air quality, comfort, and safety. 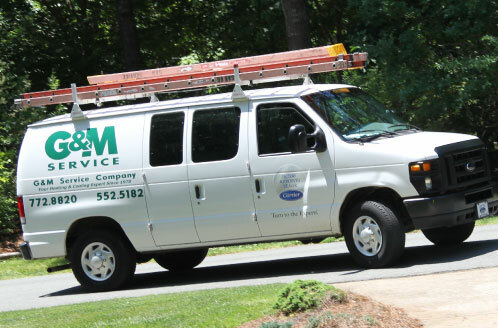 G&M Service have been a leading heating and cooling provider to customers in Raleigh and the surrounding areas since 1978. Not only do our team of technicians have tons of experience, but they also know how to solve any problem you may face. When something goes wrong with your heating or cooling unit, you can’t get a solution fast enough. We do our best to always make sure customers feel secure in the work we do and the service we provide. Choosing G&M Service as your heating and cooling provider is one decision you can be confident in making. G&M technicians have the experience and resources to guide you through sales, service, and installation. The G&M Service team stays up-to-date with all the latest information and certifications. This includes everything from new equipment to developments in the HVAC field. We strive to make sure our knowledge will benefit you the most. While HVAC problems might look the same, we know that every customer is unique and deserves top-notch customer service. As a Carrier Factory Authorized Dealer, we meet strict guidelines for customer service and can assure you that our technicians act professionally and respectfully. Are you comfortable in your home? Our experts can help you get the best indoor environment. We’ll make sure it’s cool in the summer, warm in the winter, and safe all year round. G&M employees have thorough training and NATE certification. Both qualify them to diagnose your HVAC issues and provide comprehensive solutions to any problem you may have. No need to lose sleep – G&M has you covered. If you’re worried about a potential heating or cooling problem, or think it might be time for a new system, get an expert opinion that can put your mind at ease. Call 919-772-8820 today for a detailed list of expert HVAC services at G&M. Can’t say enough nice things about Greg. Took time to check out my HVAC equipment thoroughly. Explained what he did and what he found. Recommended a service agreement.